Do you use high resolution widescreen monitor? And still working in Windows like those good old days of CRT / low resolution monitors? Well,Â see and doÂ more work with great ease by splitting windows on your high resolution widescreen monitor for free. 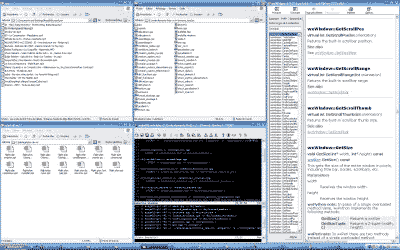 WinSplit Revolution is a free application that makes process of splitting and managing multiple screens very easy. You can divide screen in number of windows like 2, 3, 4 and so on. Windows can be easily placed, sized and zoomed using virtual numberpad or keyboard shortcuts. It sits on system tray and supports drag – drop of windowsÂ without much strain on system resources. There is layout manager for customized layout of different windows on the screen. Download Winsplit Revolution to split and divide windows they way you want!